Gifted education has an identity problem. If you ask many people, gifted programs exist because “gifted” students have unique needs. But what does this mean? And what is the overall purpose of K–12 gifted education? Even within the gifted education community, the actual outcomes of “gifted” programs are too often unclear, leading to charges of ineffectiveness at best and outright discrimination at worst. In one sense, gifted services exist to develop advanced abilities—to provide interventions to those students who need them in order to develop excellence. Some students have unmet academic needs, that’s where gifted education kicks in. Makes sense, right? However, the kids served in gifted programs are disproportionally from white, Asian, and higher-income families. This is a problem for political and advocacy reasons, but also because the majority of American students now come from low-income or racial/ethnic minority families. If the U.S. educational system can’t develop the talents of African American, Latino, or low-income students, what good is it? In gifted education, there is often tension between two implied goals: developing excellence and promoting equity. In a recent Gifted Child Quarterly article, my colleague Kenneth Engerrand and I tried to come up with a way to balance this excellence/equity dilemma. We found that some gifted programs lean too far toward the equity goal at the expense of developing excellence. In theory, developing a test—the results of which made all people look the same, even though they are not—would all but assure proportional representation in gifted programs, but it would do so at the expense of actually identifying the students most in need of additional challenge. Most often, gifted education leans the other way, emphasizing high achievement despite terrible rates of disproportionality as a result. The achievement of either goal on its own is insufficient. Developing advanced achievement with no attention to equity, thereby missing the majority of students, is an advocacy loser. At the same time, focusing solely on proportionality would miss the point of developing excellence. K–12 education needs to balance the development of excellence with efforts to address equity. In the twenty-first century, it’s simply unacceptable to have programs that solely focus on the former without proactive efforts toward the latter. 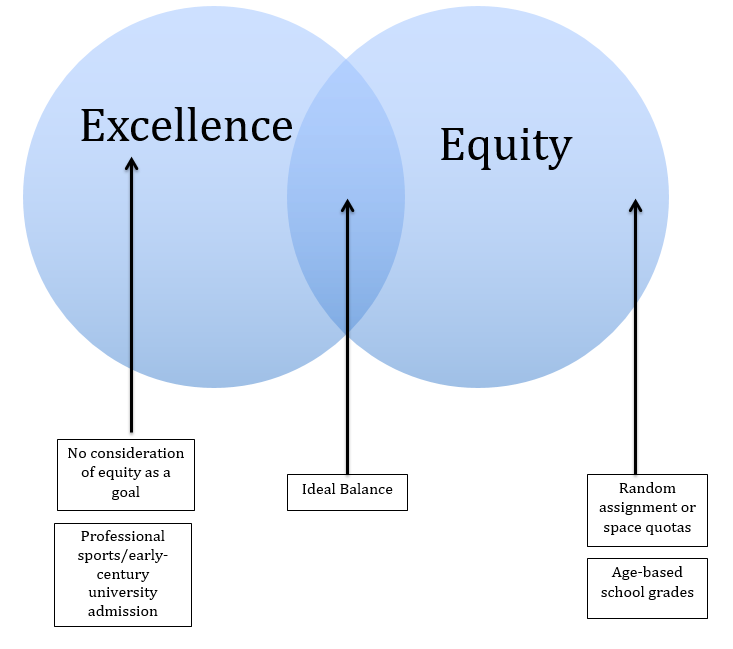 Figure 1 presents the two goals of excellence and equity along a hypothetical continuum. Why don’t the circles overlap? A less cynical person might reasonably ask, “Why can’t we have it both ways? Why don’t the circles overlap?” In an ideal world, they would. If educational opportunity were not associated with race or income, and if there were no institutional or explicit racism left in America, these two circles would more closely overlap. Unfortunately, access to high-quality preschool, full-day kindergarten, and higher education are all strongly correlated with income. Like it or not, access to talent development services is as well. With low-income populations being disproportionally African American and Latino, these students end up being underrepresented in gifted programs. Figure 1 presents a few examples where “programs” lean to one side of the continuum or the other. For example, professional football is 100 percent about high-end performance—organizations take the most talented players and further develop them into teams that demonstrate advanced performance (a.k.a. “winning”). Whether or not a team is disproportionally white, black, or poor is an afterthought. On the far right side are some age-based classrooms where students are randomly assigned. Whether a student is years behind or ahead, he or she is generally placed in a learning environment based on age. There are reasons to think this is changing, but groups such as the National Education Association still see anything less than complete heterogeneous grouping as inherently suspect if not outright discriminatory. What is needed for K–12 gifted education is some kind of identification system that balances both priorities. Colleges and universities have been more proactive about this. Some conduct extensive outreach to locate potential applicants and then provide extensive support programs for admitted students to ensure that they are successful. Jonathan Plucker and I discuss some of these examples in a book to be released this fall. So what would this look like? First, students would be identified based on how they perform relative to peers with similar educational opportunities. The best way to accomplish this would be to compare low-income students only to other low-income students, or English language learners (ELL) only to other English language learners. This avoids equating apples with oranges. It also treats low-income and ELL students differently in order to further the goal of equity while also using the same identification processes that were used for all students (with the same percentile cutoffs) to balance equity with excellence. As an approach, it’s far from perfect, but it would help move gifted education programs toward equity while still developing excellence in students who are in need of such services. Scott Peters is an associate professor at the University of Wisconsin-Whitewater.